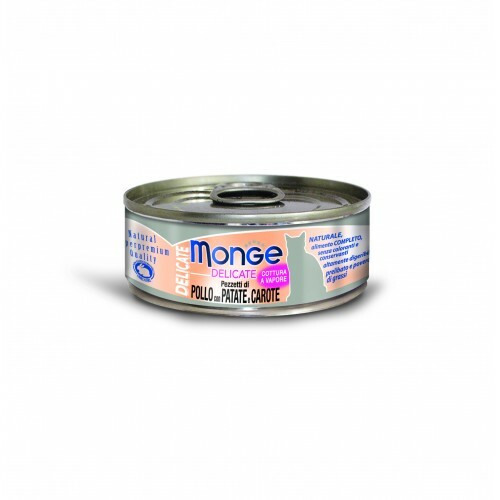 Monge is a line totally dedicated to the natural feeding, only natural ingredients highly selected, very high quality, complementary food for cats with delicious chicken, produced in Thailand, with all the typical features of the high quality products: high palatability from freshness and good quality ingredients, with high nutritional content, rich in Omega 3, rich in proteins, with low fat content. 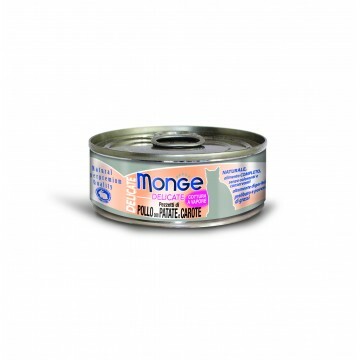 These products are totally natural, without preservatives and colorants, gluten free. 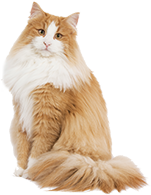 Good for helping the cat to keep smart healthy shape, energetic, fresh all the time. Chicken 60%, tuna 10%, 3% potato, carrot rice 3%, FOS (fructo-oligosaccharides). Vitamin A 2000 ul / kg, Vitamin D3 200 ul / kg, vitamin E (alpha-tocopherol) 25 mg / kg. Moisture -- 79%, crude protein -- 18%, crude fat -- 0.3%, fiber -- 0.5%, crude ash -- 1%.